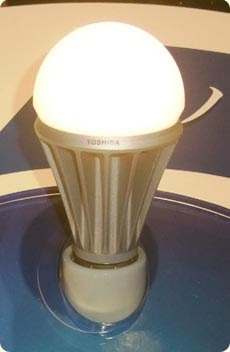 LED lightbulb (high-output) will be released by Toshiba Lighting & Technology Corp with a total flux equivalent to that of a 60W incandescent lamp with power consumption 8.7V. And the luminous efficiency of the natural white type is 93lm/W, which is higher than those of any other similar products announced so far. While one illuminance, is equivalent to that of a 150W incandescent lamp and another illuminance higher than that of a 100W incandescent lamp. This LED lightbulb which is equipped with a large-size LED package measures approximately 15 x 15mm, the natural white type and the warm white type feature total fluxes of 810lm and 600lm, respectively. The company used Nichia Corp's general-purpose LED package for its previous product but uses its own LED package this time aiming at a total flux 1.5 times higher than that of the company's former product that is equivalent to a 40W incandescent lamp in terms of total flux, improvised luminous efficiency by dispersing more than a hundred LED chips in a large package to prevent heat from concentrating. The company elongated the chassis by 10mm to 119mm to expand the radiating area as the heat increases proportionately to the brightness produced. The product which weighs 160g as that of company previous product has a life of 40,000 hours.